"Timing is crucial in every endeavor. In music, in comedy and in every project you undertake. Flourish Editing came into my work space near the beginning of my effort on my first book, The Sun God’s Heir: Return. The book enjoyed a number of editors before its current form, but Salomé and Tim placed my feet on the path and for that I am very grateful. Good editors are a combination of drill sergeant and guardian angel. The one doesn’t take prisoners, and the other picks you up after you step in a pothole.  Flourish Editing is that wonderful combination of skill and experience, overseen with love. You can’t do better." "Salome Jones is wonderful to work with. Her detailed insights and invaluable input have taken my manuscript to the next level. I wouldn’t trust anyone else with my work." "As a complete novice I knew I needed an editor but I had no idea where to start. Salome Jones was recommended by a friend and so !sent her the first five hundred words of my manuscript. I had no idea what to expect but Salome is the most brilliant, perceptive editor I could have hoped to find. Salome tutored and explained, reconstructed and chopped, queried and praised and shaped my story into a tight, marketable book. We have now just finished book two and I couldn't be more thrilled with the result." Note: Roxane's novel The Pearler's Wife has been acquired by Harper Collins UK and Penguin Random House Australia and will be published in 2018. "When I hired Salome Jones as my editor/mentor, I was working on my first writing project – Lost in Kakadu. As a first time author I had no idea what I was doing and Salome, was patient, meticulous, consistent and most of all professional. She taught me every process from character and story arcs, to point of view, to sentence structure. Salome helped me develop my voice with reading and writing projects. She helped me take my horrible draft and polish it until it shined. Lost in Kakadu was subsequently published in 2013 and won Romantic Book of the Year in 2014 and it’s also been short listed for a clutch of other awards. This book would never have reached this success without Salome. I highly recommend Salome’s expert services. I wouldn’t be living my full-time author dream without her." "I know the two of you are bringing real, friendly expertise and creativity to the table for any copy-related project, so those who'll be lucky and clever enough to work with you will be in good hands." "I'm delighted to recommend Tim to you. He is certainly not a "scammer." I hired Tim to read my first manuscript and to draft a query letter for literary agents. For some reason, unknown to me, I have found that to be more of a challenge than writing the book itself. Tim exceeded my expectations both in terms of the quality of his work and the time frame to deliver it. He effectively made comparisons to my work with that of other, already successful novels which has become very helpful to me in trying to promote my work.He also provided me with some shorter summary paragraphs. His query letter is the basis now for queries to numerous agents for my first novel, 'Time Never Sleeps.' In short, I certainly recommend him!" "Salome Jones was exactly the editor I was looking for. Someone who understood the idiosyncrasies of my work, yet was still able to cast an objective eye on how it could be improved. She worked through the editing with me, rather than dictating what she thought should be changed. She advised me on the standard practice, but let me decide if I wished to follow conventions. I couldn't have hoped for a better editor." 'I love the story, but I don’t love the writing.' That’s how I introduced myself in my very first communication with one part of Flourish Editing, Salome Jones, almost two years ago. And I was right – although I didn’t know how right until later. You see, like most people, I consumed words as a reader. There was no way possible for me to be able to write well without some sort of transition. Thus, I undertook the MFA styled mentoring program and my journey began. WOW. It was as though a whole other world opened up to me. Once my manuscript was a finely tuned piece of genre fiction muscle, I walked across the imaginary hall to knock on the other half of Flourish’s door, Tim Dedopulos. WOW, again. Along with trimming 10% from my novel and assisting with the final edit, Tim put together my query letter, synopses, log-line and held my hand throughout the query/pitch process. Basically, when you hire Flourish, you’re hiring a village of professional editors and expertise. I couldn’t recommend them highly enough." "I had just finished the translation of my novel ( Travelling in Time...) in English (I am Greek) and I needed help with my query letter, synopsis, etc. I found out about Tim through the internet. He did a great job with everything and also he was incredibly helpful with giving me many tips on various things considering my novel and how to approach the English-speaking market. The most important thing for me is that he understood the novel completely which shows that he read my book very carefully! I understand how you feel but trust me, Tim is the best choice and it is obvious that he has a lot of experience! I will ask for his help again in my second novel which is already completed when I finish with the translation!" "Ms Jones is an exemplary editor. Not only is she skilled and capable on the technical side but she also has a keen sensitivity for the writer’s aims and sensibility. Ms Jones doesn’t put her own imprint on your work, rather she polishes and improves what you have already created and makes it even more 'you'. She is, far and away, the best editor I have worked with on any project." "When I was referred to Salome I honestly thought, 'Eh, add a few commas. Take out this, add a little of that and BAM. Finished.' I’d never been so wrong about anything in my life (and I’m no spring chicken). Once she figured out how to break it to me gently how big of a mess I had on my hands, she got right to work and did everything (and then some) to make sure my work was at its full potential. I will certainly go to her again and recommend her to anyone that needs a writing mentor or an editor."